Discover a blend of romance and all-inclusive luxury at the intimate, adult-only Valentin Imperial, Riviera Maya. Amenities: Elegant and spacious Junior Suites with one king or two double beds, living area, in suite hydro massage bathtub for one, one vanity and vanity mirror, bathrobes and slippers, one flat screen TV in the bedroom area, radio/alarm clock with iPod dock, electronic in-room safe (laptop size), coffee and tea maker set, daily stocked mini-bar, iron and ironing board, and turndown service. Amenities: Elegant and spacious Junior Suites with one king bed, living area, in-suite hydro massage bathtub for two, double vanities and vanity mirror, bathrobes and slippers, one flat screen TV in the bedroom area, radio/alarm clock with iPod dock, electronic in-room safe (laptop size), coffee and tea maker set, daily stocked mini-bar, iron and ironing board, and turndown service. Amenities: Elegant and spacious Junior Suites with one king or two double beds, living area, in suite hydro massage bathtub for two, double vanities and vanity mirror, bathrobes and slippers, one flat screen TV in the bedroom area, radio/alarm clock with iPod dock, electronic in-room safe (laptop size), coffee and tea maker set, daily stocked mini-bar, iron and ironing board, and turndown service. Amenities: Located on the third floors of buildings six, seven and eight. There are gorgeous views to the golden meandering swimming pool as well as a natural lagoon and its mangrove. Open concept suites located on the third floor with king size bed. No handicap rooms in this category. Amenities: Elegant and spacious Junior Suites with one king bed, living area, in suite hydro massage bathtub for two, double vanities and vanity mirror, bathrobes and slippers, one flat screen TV in the bedroom area, radio/alarm clock with iPod dock, electronic in-room safe (laptop size), coffee and tea maker set, daily stocked mini-bar, iron and ironing board, and turndown service. Amenities: Golden Swim-Up Jr Suites is 667 sq. ft. Junior Suites on the ground floor equipped with one king size bed and an over-sized terrace. Located in buildings six, seven and eight, an oval double Jacuzzi separates the bedroom from the bathroom (closed concept) with bidet. Large sitting area with a second TV. These ideally situated suites are directly in front of a pool with only a patio, a patch of grass and two lounge chairs separating the suite from the welcoming water. Perfect for the Guest who wants to feel as if the pool is an extension of their suite. Amenities: Large suites provide a separate living room with sofa-bed and a roof terrace. Located in buildings one through five, these corner units provide comfort and space. All Diamond Suites have king bed only and feature one bathroom with double Jacuzzi. Living room features a second TV with Dolby surround sound and a dining space. Perfect for the Guest looking for extra service and personal attention. Privilege amenities are included. No double beds or handicap rooms in this category. Suites offer the same services but are not identical and have a different room distribution. Amenities: Large suites with separate living room and sofa bed. Roof terrace is complete with outdoor Jacuzzi. Located in buildings two through eight, these corner units provide impressive views of the resort. All Imperial Suites have king bed only and two bathrooms, one with a double Jacuzzi. Living room features a second TV with Dolby surround sound and a dining space. Perfect for the Guest looking for the ultimate in luxury, service and personal attention. Privilege amenities are included. No double beds or handicap rooms in this category. Suites offer the same services but are not identical and have a different room distribution. Amenities: Elegant spacious Junior Suites include a king or two double beds, with pillow menu, in-suite Hydro Massage bathtub; elegant furniture, LCD TV, DVD player and wide selection of satellite channels; in-room safety deposit box, radio/alarm clock with iPod dock, iron and ironing board, stocked mini-bar, black-out drapes, individually controlled air conditioning and ceiling fan, complimentary high-speed internet access, coffeemaker, bath robes and slippers, spacious, modern bathroom, vanity mirror, hairdryer and deluxe bathroom amenities, evening turndown service, and terrace or balcony with patio furniture. Amenities: Elegant and spacious Junior Suites with one king bed, living area, pillow menu, in-suite hydro massage bathtub for one, double vanities and vanity mirror, bathrobes and slippers, two flat screen TVs, one in the living area and one in the bedroom area, films are available at no extra cost from the concierge, radio/alarm clock with iPod dock, electronic in-room safe (laptop size), coffee and tea maker set, daily stocked mini-bar, iron and ironing board, and turndown service. 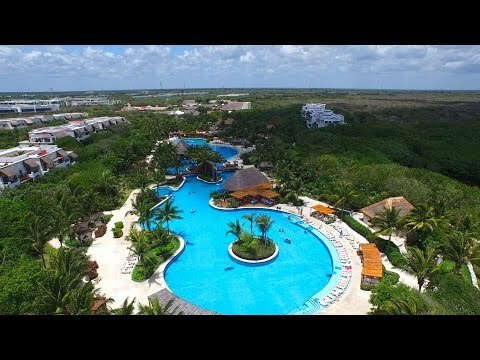 The resort sits on a half-mile stretch of white sand beach, known as Playa Del Secreto `The Secret Beach` in the Riviera Maya, just 22 miles/37 kilometers south of the Cancun International Airport. While staying there, Guests enjoy the privacy of a secluded location, but for those seeking adventure; the resort is just minutes away from the vibrant culture of Cancun and Playa del Carmen, as well as the world-famous Mayan archaeological sites Tulum, Coba, and Chichen Itza. Valentin Imperial, Riviera Maya is committed to preserve the environment by reducing the consumption of natural resources, promoting among Guests and staff protection and respect for the environment through good environmental practices. Discover a blend of romance and all-inclusive luxury at Valentin Imperial, Riviera Maya. This intimate all-adults resort provides Guests with upscale accommodations, fine dining, and superior amenities in a tranquil and relaxing oceanfront setting. The Guest suites are expertly and elegantly outfitted and overlook the majestic Caribbean Sea or overlook the beautiful pool and lagoon area. The resort offers 524 luxurious suites distributed alongside the resort in two and three story villas. You can choose from a wide range of suites, including some with swim-up access to pools. In addition, enjoy an array of exclusive amenities including concierge service, 24-hour unlimited drinks, a pillow menu for a good night sleep, free Wi-Fi and much more. The resort offers a selection of eight restaurants, 11 bars, room service, and reservations are never required! All restaurants offer different dietary food options such as vegetarian, low-fat, etc. Dine in the privacy of your suite with room service, 24-hours a day. Room service choices are in the in-suite menus. Valentin Imperial, Riviera Maya also offers you the option to have an unforgettable romantic dinner on the beach. This service requires a reservation and has additional charges. For more information regarding this service, please contact your concierge. Daytime: Dress, shorts or jeans, swimwear must be dry and covered. No bare feet. Beachwear, sportswear, shorts, sleeveless shirt, baseball caps, tennis shoes or sandals are not allowed. The perfect place to discover your senses and experience total relaxation. They have designed a variety of extraordinary treatments for your well-being, while offering unique massage techniques to achieve a perfect rest; facial and body treatments to regenerate, hydrate and rejuvenate the skin, and at the same time utilizing a combination of aromas creating a unique sensory experience. Rituals are designed to achieve a complete balance between body and mind, incorporating their favorite massages and treatments for your skin. The highly qualified personnel will provide you a memorable and magical experience. Free Honeymooners Extras When Staying Seven or More Nights: Welcome letter from the hotel director, fruit basket and sparkling wine upon arrival, honeymoon in-room breakfast the first day after arrival, honeymoon turndown service, and 10% discount on all spa treatments. Please request your honeymoon package at time of booking. Wedding certificate or proof of marriage could be requested at time of check-in. You`ll enjoy your unforgettable trip from start to finish as soon as you arrive with your free welcome cocktail! The Valentin Imperial, Riviera Maya features excellent onsite dining, bars, an onsite spa and so much more! Relax at the Salon Partagas, the perfect place to enjoy an aromatic cigar, and you will frequently encounter a professional cigar master. You can also make a selection from a choice of fine tequilas and cognacs - extra charges may apply. El Cafe is a comfortable place to enjoy a delicious coffee while reading your favorite book or magazine. At the sports and music bar you`ll laugh and dance the night away enjoying the lights, video, disco, dance floor, bar and, of course, entertainment and activities team. Live music schedules change weekly. El Palenque is located in the expansive and enthralling theater. Witness lights, camera, action, music and dance, movies, shows, even circus entertainment, all while you enjoy your favorite cocktail. La Plaza strategically located in the Mexican Plaza, it is the ideal place to begin a romantic evening. Keep up your routine at the onsite fitness center which provides cardio-conditioning and exercise equipment, including treadmills, spinning bicycles, and free weights. The fitness center also offers several classes of yoga and Pilates. Open daily from 5:00 A.M. to 11:00 P.M.
Live an unforgettable wine tasting experience as you join them for a fantastic journey through the world of wines. They invite you to use your senses as you discover the secrets of six varieties of grapes accompanied by gastronomic delights specifically prepared for each one. Thus you will identify the wine`s true essence as you enjoy their characteristics to the fullest.